Wash the blackberries and leave in a large bowl covered in water for 20 mins after picking. This encourages any bugs and bits to float to the surface. Peel and cut the apples into small chunks. 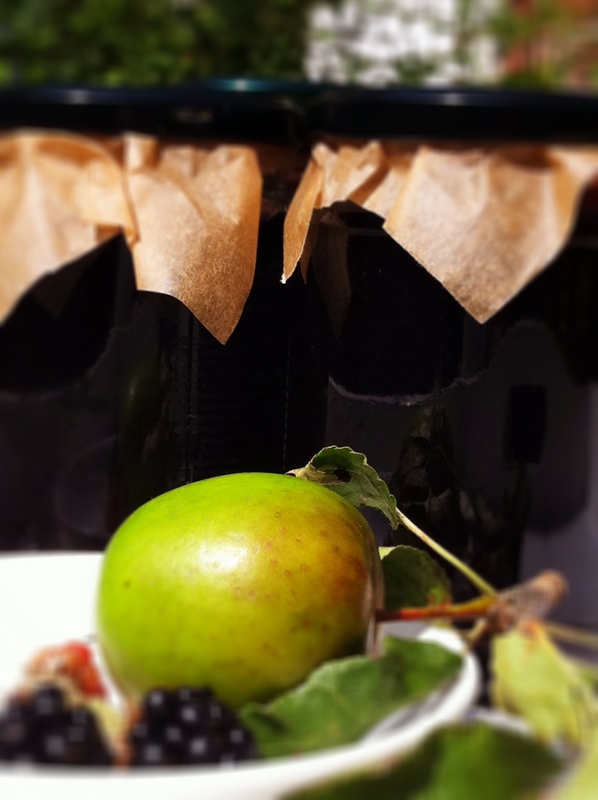 You don’t need to core the apples, as the pips contain natural pectin, which will help to set the jelly. Empty the water from the blackberries and transfer them and the apples into a large preserving pan. If you don’t have one of these, you can use a saucepan, but will need to keep close attention to it so it does not boil over. Add the water and bring the fruit to a gentle simmer, for 20 minutes. Then gently press the berries into the side of the pan to squash them and release all their juice. This takes 5-10 mins. Prepare a large muslin cloth by rinsing under water and suspending over a large bowl or pan. A better alternative is to use a jelly strainer that comes with a stand, as it’s more stable and safer when you’re dealing with hot liquids. Pour the hot fruit juice and pulp into the strainer and leave to strain for at least an hour, but it’s best to leave it overnight. 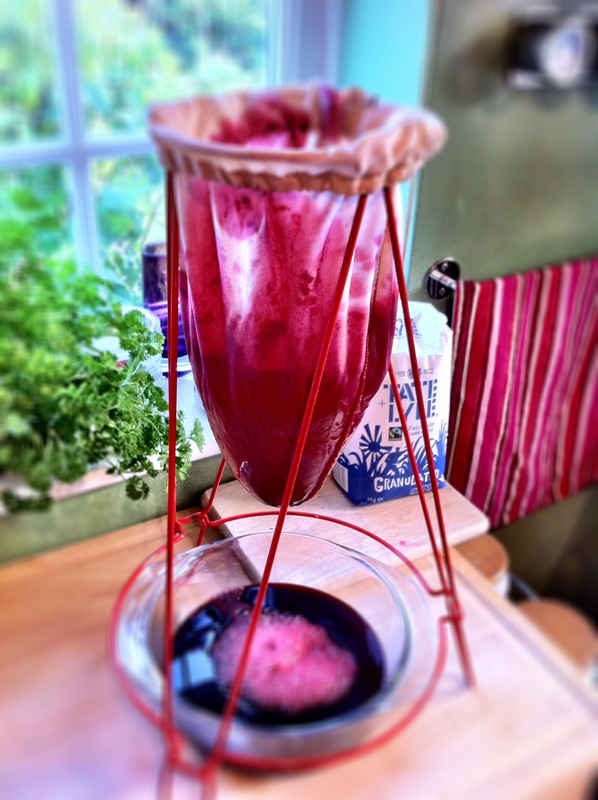 The juice filters through leaving all the pulp and seeds inside the muslin. I like to add a small dessertspoon of the pulp back to the juice to make a jam with a few seeds in, otherwise leave it out for a clear jelly. Get the jars ready. You can buy preserving jars, but most people keep their old jars and re-use them. My mum always told me not to use ones that have had vinegar, onions or curry, as they will retain the aroma and make the jam taste ‘interesting’, but the smell is in the lids, not the glass jars, so you can insulate from this with baking parchment . 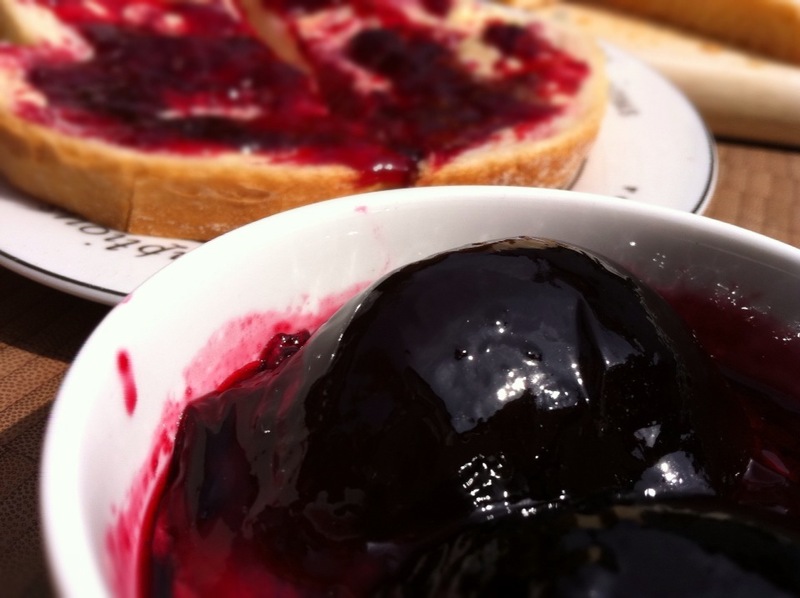 To stop any chance of mould growing in your jam, you sterilise by taking the jars and lids, washing in warm water first, and then pour boiling water. *CAUTION* You must not do this to COLD jars, even preserving jars, as they will crack or shatter. Leave them on a tray for later. Cut squares of baking parchment that will fit between the lid and the jar and set aside for later. 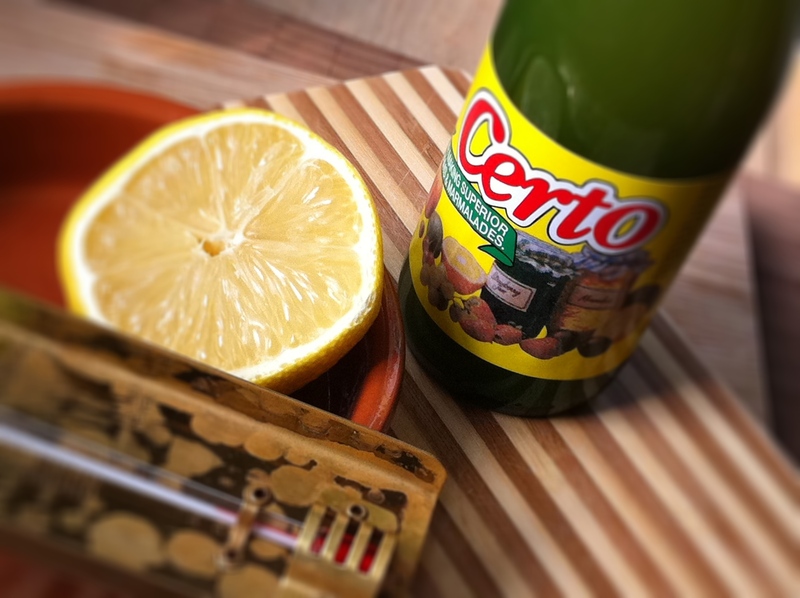 Return the fruit juice to a low heat and add the lemon and sugar until dissolved, then bring to a rolling boil. *CAUTION* As I discovered today, leaving boiling jam on the stove is a big no no: because the jam is dense with sugar, it stores the heat and releases heat bubbles more slowly than water: it’s like slo-motion water, so if you let it boil too much, it quickly boils over and you can’t stop it until it settles down, by which time you’ve lost a load over the hob. It’s also well over 100 degrees C, and sticky to boot, so keep your fingers out. Boil the Jam, stirring continuously so as not to burn until the jam reaches 104-105 degrees. Use the jam thermometer to test. Having reached this temperature you should get a jam which will set. Remove from the heat and add the pectin, and stir well. You can test to see if the jam will set properly by taking a cold plate and dripping a few drops onto it. Wait a minute and see if the droplets form a skin. If not, then rebuild until you get to 105 degrees for 3mins and retest. 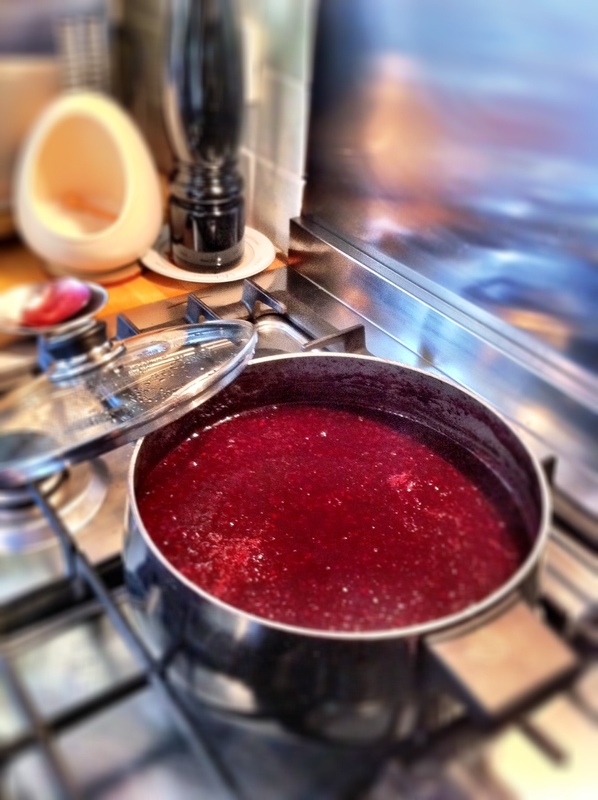 Remove the mixture from the heat and carefully ladle the jam into the jars whilst the jam is still hot. 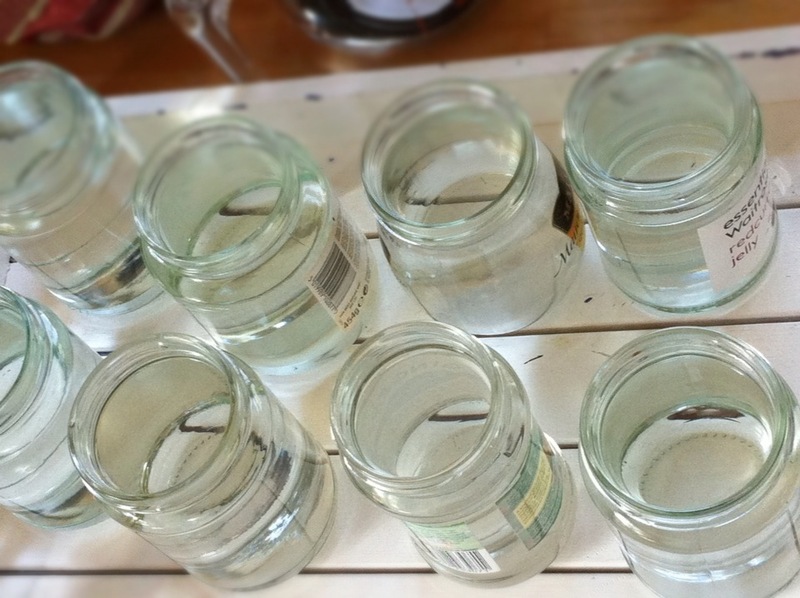 Place the parchment onto the top of the jar, and put the lids on quickly as you fill each Jar. If you wait till they are all filled the glass of the jars will be very hot to touch and difficult to hold to screw the lids on. 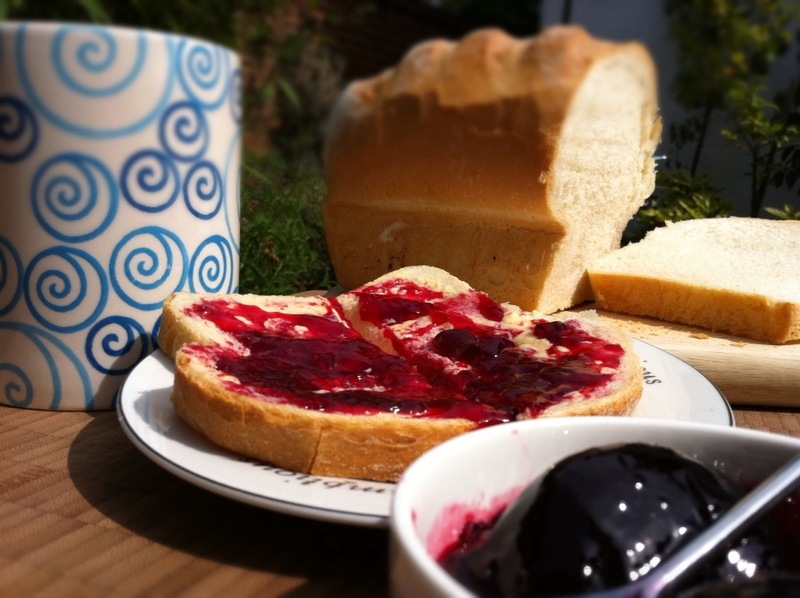 Store the Jam in a cool dark cupboard or larder. Once opened keep in the fridge. And try not to eat it all at once. Thanks for this recipe — I was eager to read the sequel to the bramble-picking post. As thebigfatnoodle says, free fruit has its price … and those bramble thorns extract a painful one.